If you are in the market for a new home, it is wise to have the entire structure inspected, including the plumbing, before you close the deal. 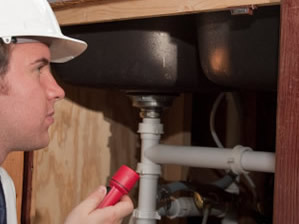 You can also inspect the plumbing system yourself if you know what to look for. Never take everything at face value, especially when it comes to a major purchase like a home - doing so can make you end up spending a ton of cash later on down the road when you discover problems within the plumbing system. Most sellers are motivated to get rid of their real estate right now, which makes pointing out any big problems that you find all the more important. Locate the water meter and make a determination if the shut off valve to the home's water supply is in working order. If the home is equipped with well water, the shut off valve will be located inside the home, usually under the kitchen sink but is often found elsewhere. When you shut the water off using the shut off valve, there should be no water coming out when you turn the taps on in the kitchen, bathrooms, or other areas. Find out if there are any lead pipes in the home. Homes that were built prior to 1986 often have lead or galvanized plumbing. Lead, as you know, no matter how useful, is an environmental toxin (note the need for unleaded gasoline and paint in homes that is not lead based). If you have children, you may not want to live in a home that has lead pipes. Determine the size of the water pipes in the home and around the home - they will help to determine the water pressure that you'll have. For water pressure to be adequate, the lines should be ¾" to one inch directly from the main water source for the home. The pipes themselves should be at least a ½" in diameter to provide adequate flow. Inspect the home's hot water heater. You will be looking to see if it is big enough to accommodate your needs (a family of four should have at least a 40 gallon tank), where it is located, and the water heater's age. Check to see if there is a buildup of mineral deposits in the tank, if possible. Mineral deposits can settle on the tank's bottom, leaving less room for water - which will mean that less water will be heated and available for use. Also, corrosion of the tank's elements can cause the tank to have a short life. If the water heater is old or you see obvious signs of corrosion, request that a new one be installed. Make sure that the plumbing throughout the home is prepared for freezing weather by having pipes wrapped. The vents throughout the home should be the type that can be closed off in the winter time during periods of intense cold. For homes with wells, the well should be protected in some fashion from bitter cold as well. Determine the type of sewage system the home has, whether waste goes to a municipal sewer system, or if there is a septic tank installed. If the home has a septic tank, find out where it is installed on the property, how much the tank holds, and where the lines to the septic tank are located. Ideally, you want a map with the paperwork that comes with your home that shows where the tank and all lines to the tank are located. Also, ask the owner or seller when the tank was last emptied or serviced. Look for signs of seepage around the area where the tank is located, or for standing water or noticeable odors - all of which are signs of a problem with the septic. Septic tanks can be very expensive (thousands of dollars) to replace or repair - so if there is a problem, demand that it is fixed prior to closing the deal. Inside the home, check the kitchen faucets and bathroom faucets for leaks or drips. Check underneath sinks to check for leaking pipes. Flush the toilet in each bathroom. They should empty and then refill correctly. Turn on the shower in the room farthest from the home's water source. Check the temperature of the water and the water pressure. It is important that you address any and all problems that you find in the home's plumbing system (or elsewhere in the home, for that matter) with the seller or realtor prior to making an offer or closing the sale. While many homes come with a home warranty that will cover the various systems within the home for a specific period of time, you can still be out of pocket if the plumbing system is in disrepair and your home becomes damaged as a result. In most instances, you will find that repairs that need to be made will be made in order to get the home off the market. If you are a bit handy and have the time to do repair work yourself, you can also use the results from your home plumbing inspection to negotiate a lower price on the home to accommodate for the supplies and labor involved in correcting any problem points.